Almost all innovations presented over the past few years have been based on LED technology. They are usually limited to two aspects: One is the attempt to make the light source as small as possible. The other is related to the first, geared toward “creatively” transforming specific technical parts, such as the filament, into substantially more effective diodes. However, in the overall arrangement, many of these changes remain completely conventional – something that cannot be said of Hauke Unterburg’s and Julian Wallis' LOT. 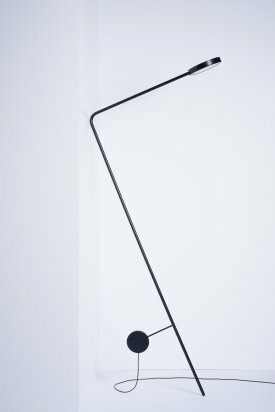 They, too, may apply the same technique, but the innovation potential of their LOT is based on the use of an age-old mechanical principle (one that has been thoroughly ignored over the course of the whole technology euphoria): the lever rule. Theri LOT features not only a 180-degree swivel head, but also a perfect balancing act. 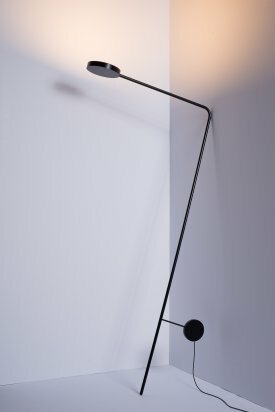 Without any additional fixtures, this L-shaped floor lamp is not placed on the floor as usual, but, depending on the desired beam angle, is simply leaned against the wall in its corner point. This may sound wobbly at first. 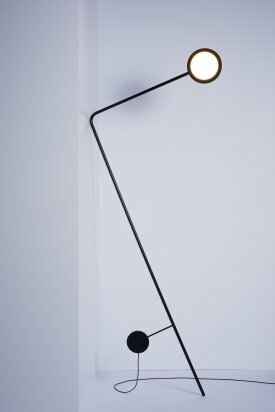 But it turns out to be absolutely stable, as a counterweight in the lower part of the L provides the necessary balance. Peering more closely, this LOT thus represents a sort of pendulum, although the pendulum only serves to fix the structure.